Operating a booth at a farmer’s market is an excellent way to flex your entrepreneurial muscles. With the right planning, you can create a business that flourishes and produces a healthy income. There are definitely a few things to consider before you take the leap, as maintaining a booth is a huge commitment that can involve several months of your time. Do your research, prepare in advance, and keep things speedy with mobile payment processing and you’ll blossom at the market. Are there any competing products? Or will your product(s) be the only one of its kind? What is the vibe of the market? How elaborate are the displays? Will your booth require a great deal of design or display materials? Does it stay busy all day? How happy are the other vendors with the market? 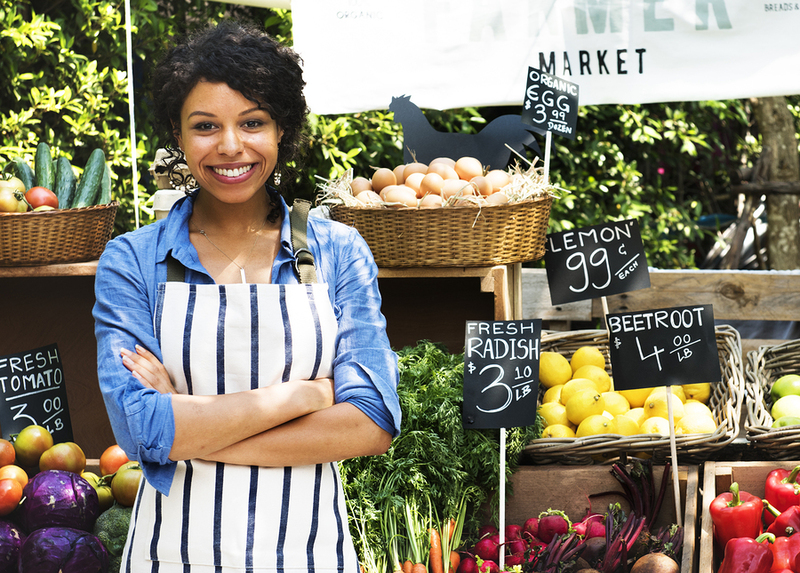 In order to be profitable as a farmer’s market vendor, you’ll want to offer at least some items that can’t be found from other vendors. When it comes to food and crafts, Farmer’s Market shoppers are looking for unique items and ingredients and superior quality. If there is an overlap in products, be sure to evaluate the price of similar items, so you don’t underprice and annoy other vendors. For example, if you and Susie’s Farms both sell banana bread and she lists her loaves for five dollars, you don’t want to sell yours for three dollars and price her out of the market. Instead, list yours at the same price as hers. Spend the time on details that make your booth stand-out. Creative and eye-catching signs, varying display heights, colorful tablecloths and accents, really anything that draws the attention of shoppers is fair game. Just keep in mind that you’ll have to set-up and tear down all of the décor every weekend. Not having clearly priced items might be the quickest way to lose a sale. The majority of people will not inquire about the price of an item, this is especially true if you are busy interacting with another customer. Labeling the price of your items in a clear way is a must. Long lines make customers walk away—so maintaining a steady flow in your booth and keeping lines short is imperative. The ability to accept payment via your smartphone or tablet will not only expand your customer base, but it will also keep your lines short. Choose mobile payment processing that allows you to accept credit and debit cards quickly. Payscout is a global payment processing provider covering six continents and connecting merchants and consumers via credit, debit, ATM, and alternative payment networks. Payscout supports nonprofit business and organizations with nonprofit payment processing, offering services such as mobile payment processing that aids your business in achieving quick, easy payment. At Payscout, the mission is to support the entrepreneurial dream one transaction at a time. From keeping utilities on track with utility payment processing to omnichannel processing, Payscout will help your business thrive.